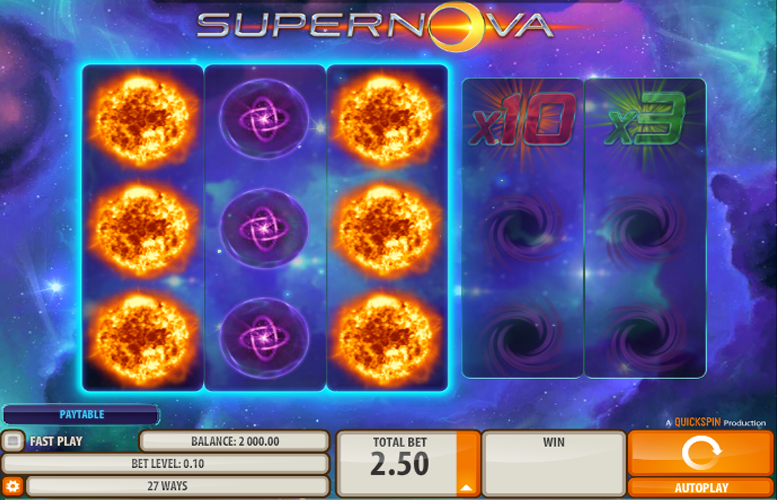 Take a trip into deep space on the Supernova slot machine from veteran designers Microgaming. This game is a simplistic offering. However, it does make use of some interesting features to keep the action fresh. 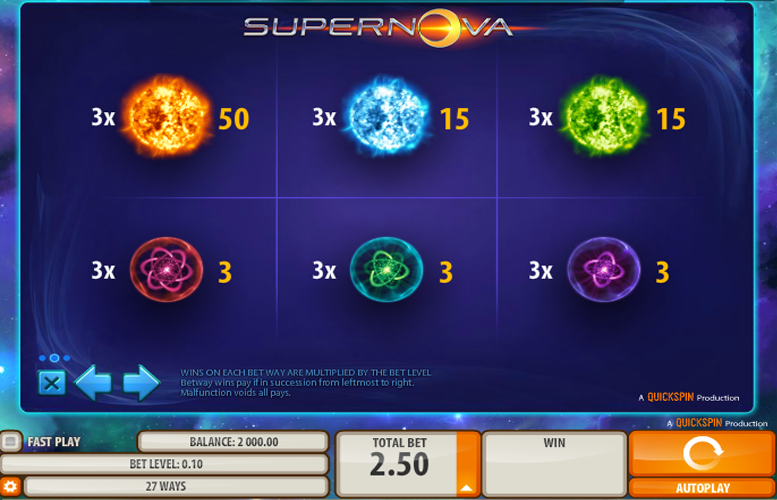 At first glance, you can tell Supernova isn’t your average three reel slot machine. It has an additional smaller set of reels off to the right of the main game board. We’ll find out more about these shortly! Massive return-to-player rating. At over 97%, this game is ideal to spin through a bonus on. Innovative yet simplistic game design. There isn’t a lot to Supernova, yet it remains exciting to play. Might be too basic for many slot machine players. What some find beautifully simplistic, others will find mind numbingly dull. Orange explosion = 50x the bet level. Blue explosion = 15x the bet level. Green explosion = 15x the bet level. All wins on the first three reels will trigger the Multiplier Feature on the separate Multiplier Reels. All pays are multiplied by the multiplier appearing on the middle position of the first multiplier reel. If another multiplier appears on the middle position of the second multiplier reel, it’s multiplied again by that multiplier. The possible multipliers are 2x, 3x, 5x, an 10x. The worm hole symbol will end the multiplier feature. 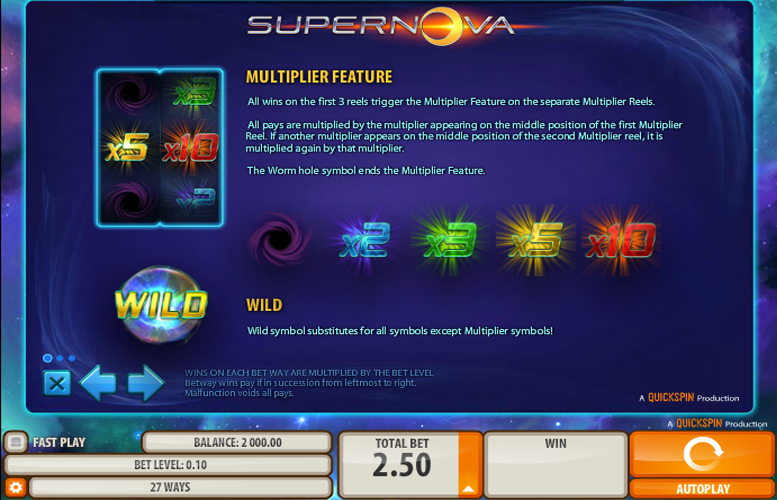 Rather than use traditional win lines, the Supernova slot machine instead favours a “ways to win” system. Payments are made for matching symbols on consecutive reels, regardless of their position. Since there are only three reels, there are only 27 ways to win. In addition to the symbols that pay the largest prizes on Supernova, there are also those that award lesser payments. These are represented by different coloured atom symbols. Again, we’ve listed the prizes for hitting three-of-a-kind of each below. Red, green, or purple atoms = 3x the total bet level. 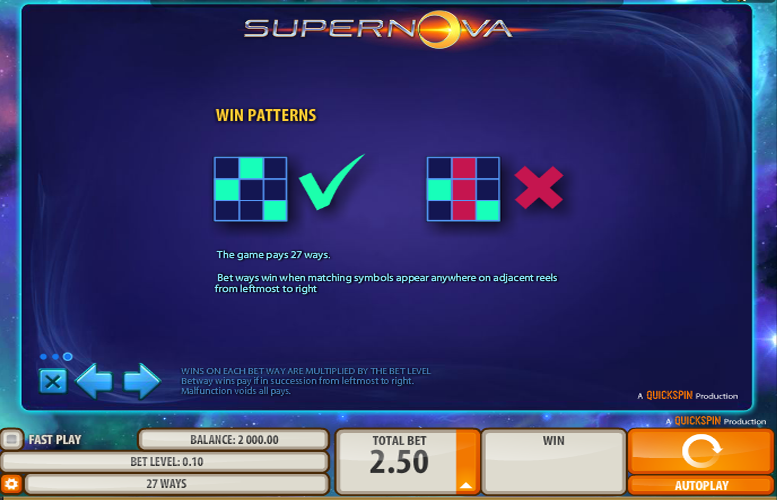 Since it’s such a simplistic game, players are only given limited options when deciding where to place their bets on the Supernova slot machine. They can only adjust the total bet. Here the options range between 25p and £50. Some of the highest rollers around might find this a little restrictive. However, most players should be nicely accommodated with such a spread of bets. All told, Supernova is an interesting title that offers players a simple to understand gameplay experience. That’s not to say it’s boring, however. Thanks to the innovative take on game board design that Microgaming have devised, there is a lot of excitement to be had from the title. Both fans of super-simplistic slot machines, as well as those who like dynamic game designs should find something to enjoy about the title. This game has a rating of 4 / 5 with 484 total reviews by the users.